We have a winner!! WooHoo! Carrie has been notified and will receive her gift card in the mail! I am super excited today to announce our first giveaway! I’ve teamed up with some other Disney bloggers to offer one lucky reader a $100 Disney gift card! The giveaway starts NOW and runs through midnight February 24th EST! Entering is easy-peasy through the form below. This will come in handy on the Disney Cruise! I am going to use it for my Honeymoon in december. I could really use this for our next trip to the "World". Of course my kids would enjoy the card. Use it on our next trip to the World or for my Disney lovin' kiddos. 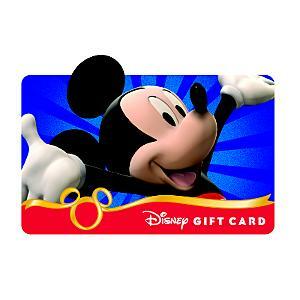 I would use the gift card for our next trip to Disney, which may be our first trip to WDW during the Christmas season to also celebrate my son and daughter's birthdays. Oh, I hope one of you wins the $100 Disney Gift Card!! If you do, please stop back and tell us all about it! We would use part of it to buy a gift to hand out to someone at the park. The rest would become our 7 year olds spending money. Thanks for offering such a great giveaway. Good luck everyone! I always love getting a Disney Gift Card as a present!! This gift card would come in handy for my many trips to Disneyland.